One of the most difficult parts about advertising multi-million dollar properties to wealthy individuals is audience targeting. Many ultra high-net worth individuals lead relatively private lives. Facebook and Google Ads have the ability to target based on wealth, reaching them largely depends on knowing where they look and what they read. One tried-and-true method for targeting ultra high-net worth individuals is to place ads in magazines that are specific to their lifestyle—Robb Report, Bloomberg Markets, Ocean Home, and more. But many brands don’t realize that another effective way to target an affluent, exclusive audience is to advertise with high-profile events, such as Wimbledon or the Cannes Film Festival. So how does this work? Advertising opportunities can begin even before the event has started. For example, the New York Fashion Week’s website contains banner advertising and many events offer advertising space in their e-newsletters. 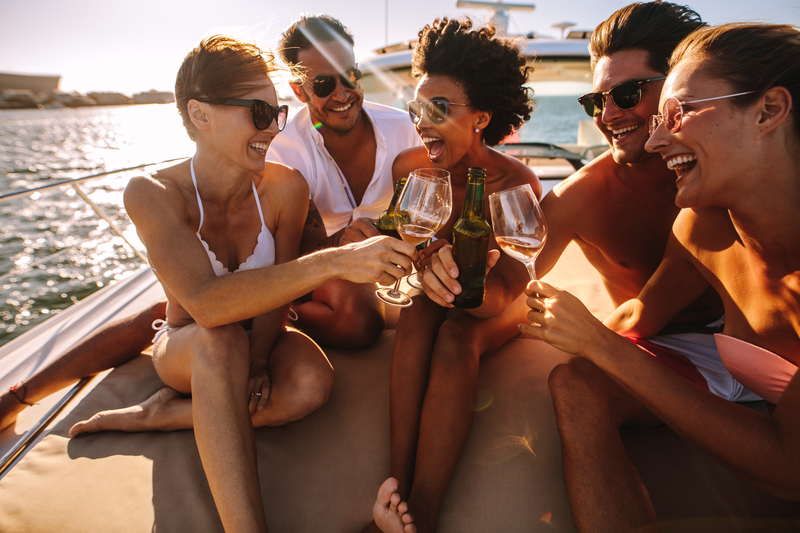 An event’s website, such as the Monaco Yacht Show, may have a section dedicated to advertising options, including how to advertise at the event itself by way of advertising in their print catalog. Advertising during an event is not limited to working with the event itself. The New York Times International Edition is the key publication for international events. A NYTIE wrap—a full page color advertisement that wraps around the paper, is handed out at high-profile events,—is one of the most valuable ad placements you can buy. And as the wraps run locally and only during the events, they’re also seen when provided by luxury hotels. Marketing luxury property at events can get even more specific when you can pinpoint your demographic by geofencing. Geofencing refers to bounding off a particular area targeting ads for people within that perimeter to advertise properties accordingly. So using the French Grand Prix as an example, the Palais des Festivals et des Congrès, the Great Sound, or Circuit Paul Ricard could serve as boundaries. This works particularly well because these events rely heavily on the use of social media, where ad placements are frequent. By advertising during high profile events, will you be able to get relevant eyes on the property you’re trying to sell and you’ll also associate your brand with luxury. The following are some exemplary high profile events that tend to attract the kinds of buyers who will be able to purchase a luxury property. As the world’s oldest Grand Prix, the French Grand Prix invites a highly prestigious clientele of international celebrities and even royalty. Especially after their return to the Formula One Circuit, the French Grand Prix is a highly sought after advertising platform. It’s no wonder that notable multinational corporations such as Honda, Benetton, Mastercard, Red Bull, and Virgin have previously advertised at the event. The French Grand Prix is also one of the more unique events to advertise, since not only does it boast opportunities for print and digital advertising, but it also has the unique colorways used to sponsor vehicles known as the Formula One sponsorship liveries. As one of the oldest international sporting events, and a symbol of the US’ meteoric rise to prominence as a global superpower in the mid-19th century, America’s Cup yacht race is one of the most storied American traditions. It also boasts a whole host of sponsorship opportunities, with notable global partners including Prada, Yanmar, and Vineyard Vines. A marketing partnership with America’s Cup is highly valuable. As is the nature with a boat race, much of the spectating of America’s Cup occurs through monitors and large screens which are also used to run advertisements.